Sergio Myers' 'The Zombinator,' shot in Youngstown in 2012. We don’t have quite as many entries into our five horrific questions feature as we did last year - but our final two are zombie greats. The first is director Sergio Myers. Myers is set to director his second zombie feature, Zombie Priest, in Youngstown, Ohio, this December. 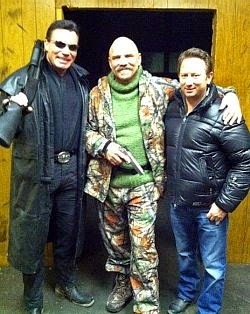 This follows Myers successful horror venture The Zombinator, which he shot in Youngstown in 2012. The film stars Patrick Kilpatrick and Joseph Aviel. The film begins as a fashion documentary and quickly descends into madness. College students must trust a former soldier turned zombie killer (Aviel) while battling the evil Colonel (Kilpatrick), a mercenary working for the corporation who designed the chemical turning people into zombies. Myers’ credits include 10 Things Every Guy Should Know and Jordan Saffron: Taste This!. He has also won the EBE Award for Best Documentary for his film about the Heaven's Gate Cult. The film was presented at the Margaret Mead Film Festival and later inducted into the American Museum of Natural History. MMM: What makes a horror movie scary? MMM: What movie frightened you the most? Sergio Myers: In my youth Friday the 13th because of the suspense and the fact it became morbidly relatable in a way. When I was a kid, I was home alone with my half brother, who was very young at the time. A creepy man tried to break in, and I assume kill us, since he was holding a pistol. It was probably the most terrifying 45 minutes of my life for sure. He walked around banging on every door and finally ended up standing outside my bedroom window staring at me. I somehow found a shotgun my father had in the house and stood in front of the window looking at this man. I was shaking. He laughed and yelled at me through the window. I wasn’t sure what was going to happen, and I’d hoped he didn’t call my bluff because I never found the bullets for the rifle. Sergio Myers: Real life is my inspiration. Look around. You have psycho killers all around and even real people eating people, thanks to crazy drugs. 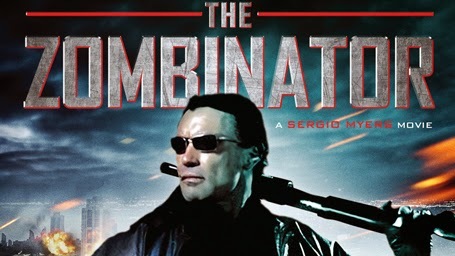 Sergio Myers: I don’t, that’s why I make zombie movies like The Zombinator (laughs). Zombie movies to me don’t really have a scare factor. Although I have a few tricks up my sleeve for my new movie Zombie Priest. I’m filming in Youngstown from Dec 26 to Jan 2. Zombie Priest will scare you. It will be very much like the horror dramas of the past, like The Exorcist. MMM: What movie would you like to turn into a horror movie? Sergio Myers: Titanic. Lots of happy rich people stuck on a big ship in the middle of the ocean, and suddenly here comes Jason and a few of his friends armed with chainsaws. Do you jump off the ship into the freezing waters below or get chopped up by the band of killers.